What does Iceland look like through Google Glass? Turns out it looks kind of like Iceland. Consider this stunning set of photographs showcasing a tool built by Silica Labs which allows users to post images from Glass directly onto their WordPress blog. If you click over to see the images, you’ll notice two things. First, you’ll see that Iceland is beautiful, something you may already have known. Secondly, you’ll see that pictures taken with Glass look, well, just like pictures not taken with Glass. There’s one exception to that second observation. When the user’s hands appear in the frame, the POV perspective becomes evident. Apart from that, these great pictures look just like every other set of great pictures. This isn’t a knock on the tool developed by Silica Labs, by the way. I’m not really interested in that particular app. I’m interested in the appeal of Glass and how users understand their experience with Glass, and these pictures, not markedly different from what you could produce without Glass, suggested a thesis: perhaps the appeal of Glass has less to do with what it enables you to do than it does with the way you feel when you’re doing it. And, as it turns out, there is recurring theme in how many early adopters described their experience of Glass that seems to support this thesis. As Glass started making its first public appearances, reviewers focused on user experience; and their criticism typically centered on the look of Glass, which was consistently described as geeky, nerdy, pretentious, or silly. Clearly, Glass had an image problem. But soon the conversation turned to the experience of those in the vicinity of a Glass user. Mark Hurst was one of the first to redirect our attention in this direction: “The most important Google Glass experience is not the user experience – it’s the experience of everyone else.” Hurst was especially troubled by the ease with which Glass can document others and the effects this would have on the conduct of public life. Google was sensitive to these concerns, and it quickly assured the public that the power of Glass to record others surreptitiously had been greatly exaggerated. A light would indicate when Glass was activated so others would know if they were being recorded and the command to record would be audible. Of course, it didn’t take long to circumvent these efforts to mitigate Glass’s creep factor. Without much regard for Google’s directives, hackers created apps that allowed users to take pictures merely by winking. 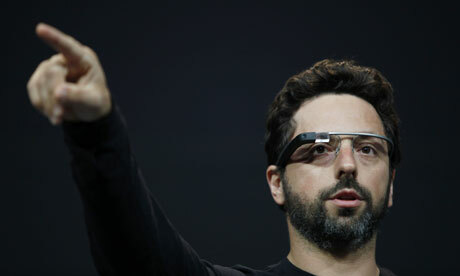 Worse yet, an app that equipped Glass with face-recognition capabilities soon followed. Hurst was on to something. He was right to direct attention to the experience of those in the vicinity of a Glass user (or, Glassholes, as they have been affectionately called by some). But it’s worth pivoting back to the experience of the Glass user. Set aside ergonomics, graphic interfaces, and design questions for a moment, though, and consider what users report feeling when they use Google Glass. “The experience is so powerful” – there it is. Glass lets you check the Internet, visualize information in some interesting ways, send messages, take pictures, and shoot video. I’m sure I’m missing something, but none of those are in themselves groundbreaking or revolutionary. Clearly, though, there’s something about having all of this represented for the user as part of their perceptual apparatus that conveys a peculiar sense of empowerment. It is possible to make too much of these statements. Other have found that using Glass makes them feel self-conscious in public and awkward in interactions with others. But Glass has revealed to a few intrepid souls something of its potential power, and, if they’re to be trusted, the feeling has been intoxicating. But why is this? Perhaps this is because the prosthetic effect is especially seamless, so that it feels as if you yourself are doing the things Glass enables rather than using a tool to accomplish them. When a tool works really well it doesn’t feel like your using a tool, it feels like you are acting through the tool. Glass seems to take it a step further. You are not just acting through Glass; you are simply acting. You, by your gestures or voice commands, are doing these things. Even the way audio is received from Glass contributes to the effect. Here’s how Gary Shteyngart described the way it feels to hear using Glass’s bone transducer: “The result is eerie, as if someone is whispering directly into a hole bored into your cranium, but also deeply futuristic.” That sounds to me as if you are hearing audio in the way that we might imagine “hearing” telepathy. So it turns out that the appeal of Glass, for all of its futuristic cyborg pretensions, may be anchored in an ancient desire that has long animated the technological project: the desire for the experience of power. And, privacy concerns aside, this may be the best reason to be wary of the device. Those who crave the feel of power—or who having tasted it, become too enamored of it—tend not to be the sort of people with whom you want to share a society. If you can’t quite get passed the notion that Google Glass is nothing more than a white-tech-boy-fantasy, consider that this is Glass 1.0. Wearable tech is barely out of the toddler stage. Project this technology just a little further down the line–when it is less obtrusive, more seamless in its operation–and it may appear instead that Philbin, Scoble, and Topolsky have seen the future clearly, and it works addictively. Consider as well how some future version of Glass may combine with Leap Motion-style technology to fully deploy the technology-as-magic aesthetic or, also, the potential of Glass to interact with the much touted Internet of Things. Wave your hand, speak your command and things happen, the world obeys. But letting this stand as a critique of Glass risks missing a deeper point. Technology and power are inseparable. Not all technologies empower in the same way, but all technologies empower in some way. And we should be particularly careful about technologies that grant power in social contexts. Power tends to objectify, and we could do without further inducements to render others as objects in our field of action. In her wise and moving essay on the Iliad, Simone Weil characterized power’s manifestation in human affairs, what she calls force, as “the ability to turn a human being into a thing while he is still alive.” Power or force, then, is the ability to objectify. Deadly force, Weil observes, literally turns a person into a thing, a corpse. All less lethal deployments of force are derivative of this ultimate power to render a person a thing. Starner, I’m certain, has only the best of intentions. In the same piece he writes compellingly about the potential of Glass to empower individuals who suffer from a variety of physical impairments. But I also believe that he may have spoken more than he knew. The collapse of the space between intention or desire on the one hand and action or realization on the other may be the most basic reality constituting the promise and allure of technology. We should be mindful, though, of all that such a collapse may entail. Following Weil, we might consider, at least, that the space between impulse and act is also the space for reflection, and, further, the space in which we might appear to one another as fully human persons rather than objects to be manipulated or layers of data to be mined. That is just an excellent piece, one of your best, Michael on the true, in essence, FELT effect of google glass on others and society as a whole — its increased objectification of others as objects, potentially with information or desired services, to be manipulated towards that result for the wearer without need for investment in any real and more mutually interactive “relationship”. I wonder if that is not why, in those fabled lands even perhaps of past history with tales of those with “learned powers” that actually alleviated common pains or hurts or social problems, those shamans, priests or even more, sensitive and vulnerable “witches”, chose to isolate themselves and allow others to come to them in their often cloistered communes or small woodsy cottages, when in real need of their “powers”; to be humbly asked for “in service” and with little more than the most basic renumeration, if any? Maybe indeed it was that “humbleness”, deep sense of service and very understanding discreteness and circumspection that was most critical to the use of those “powers” in a less usury and more mutually caring rather than personally profiting model, that was most critical to maintaining that sense of local “community” as relationships between people and more spiritual needs, rather than objects for one’s own gratification and increasing desire for control and power, above all? I do know this much: were I single, I would never date anyone wearing google glass ever and would consider my friendships altered out of my definition of the intimacy necessary for that very term, by Glasses’ invasion of it. But then humility and a sense of vulnerability, not entitlement and removed and distracted presence, have always been a key to me for the definitions of any healthiest form of those most meaningful, subject-based relationships. Thanks for a truly essentially clarity in trying to understand this deeply felt aversion, more clearly. True, but they also circumscribe the tasks available to be performed and lead the user to believe that those tasks are important to the exclusion of others. How does one get Google Glass? Is it reasonably priced? I’m still waiting for the first lawsuit because someone wore their Google glasses into a restricted area of a company, or got an online instant ID of someone who prefers privacy. You know it’s going to happen. Interesting piece. Thanks for sharing. An insightful essay about the potential impact that Google’s iconic ‘glass’ could have on our society. It goes even deeper to analyse and evaluate technology and magic as dichotomous in their search for power. I think this will open doors to replacing smartphones with new glasses attached with bluetooth that does the same purposes and people get to walk lighter no heavy instruments. But my concern is the human body.. How will the eyes accept this technology? Would it affect the brain and the nerves? I guess we will see by time all the answers. Deeply thought provoking.Thanks for sharing your thoughts. I referenced this superb writing on DIYDrones.com (see DIYD Blog Post titled ‘Google Glass, civilian drones, and space for reflection’) and on DroneSpeak.com as a link under ‘UAS for other applications’. Reblogged this on George's Pulse. This post was written so well, I loved it! Reblogged this on Jolly Bloggy.